Laugardaginn 4. júní kl. 14:00 opnar myndistarmaðurinn Þorsteinn Steini Gíslason sýninguna Án titils í Populus Tremula. Verkin á sýningunni eru olíumálverk sem listamaðurinn hefur unnið á síðustu þremur árum. Sýningin verður einnig opin sunnudaginn 5. júní kl. 14:00-17:00. Aðeins þessi eina helgi. Laugardaginn 28. maí kl. 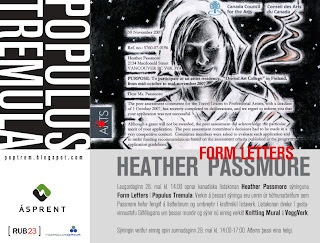 14:00 opnar kanadíska listakonan Heather Passmore sýninguna Form Letters í Populus Tremula. Verkin á þessari sýningu eru unnin úr höfnunarbréfum sem Passmore hefur fengið á listferlinum og umbreytir í kraftmikil listaverk. Listakonan dvelur í gesta­vinnustofu Gilfélagsins um þessar mundir og sýnir nú einnig verkið Knitting Mural á VeggVerk. Sýningin verður einnig opin sunnudaginn 29. maí kl. 14:00-17:00. Aðeins þessi eina helgi. 28.-29.maí og opið á milli kl.14-17!!! The title of the exhibition is a play on words with an Icelandic twinge. a piece of art ever really finished?). Ending Skaga" - the paradox of art. Laugardaginn 21. maí kl. 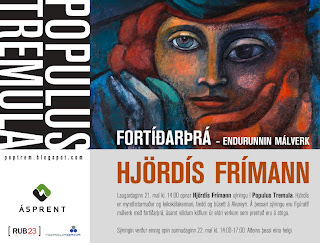 14:00 opnar Hjördís Frímann sýningu í Populus Tremula. Hjördís er myndlistarmaður og leikskólakennari, fædd og búsett á Akureyri. Á þessari sýningu eru fígúratíf málverk með fortíðarþrá, ásamt völdum köflum úr eldri verkum sem prentuð eru á striga. Sýningin verður einnig opin sunnudaginn 22. maí kl. 14:00-17:00. Aðeins þessi eina helgi. Um helgina verður vegleg sýningu á verkum nemenda Myndlistaskólans á Akureyri. Sýnd verða verk nemenda fornámsdeildar, listhönnunar- og fagurlistadeildar. Þar gefur að líta sýnishorn af því helsta sem nemendur hafa verið að fást við í myndlist og hönnun á þessu skólaári. Alls stunduðu sextíu nemendur nám í dagdeildum skólans og af þeim munu tuttugu og þrír brautskrást frá skólanum að þessu sinni. Einnig verða sýnd verk eftir nemendur sem voru á barnanámskeiðum á vorönn. Allir eru hjartanlega velkomnir í Myndlistaskólann á Akureyri sýningardagana. Opnunartími kl. 14:00 til 18:00 laugardag og sunnudag. Í menningarhúsinu Hofi verða sýnd ljósmyndaverk útskriftarnema í Fagurlistadeild. · knowledge of English language is a must, ability to express yourself in English in writing is desirable. · producing, by May 2012, an individual documentary photography project in framework of the “European borderlines” subject, which will combine the results of work in own country and the country of residency. · June - October 2012 and beyond: presentations in participating countries and at European photography events. The work on individual projects will be supervised by Vanessa Winship and George Georgiou, including on-line tutoring between the workshops. The participants will also receive regular mentoring and advise from local coordinators/tutors. - Participation in the project workshop at the International Summer School of Photography 2011 and editing workshop in Turkey is free of charge (including accommodation and meals). - Travel costs to both workshops are partially reimbursed (the project budget will cover at least 60% of the travel costs and all necessary visa costs for Turkish participants). - The participants will receive a fixed allowance of USD 405 to support the costs of their artistic production at home, and a fixed allowance to support the costs of residency in foreign country (EUR 875 on average, adjusted to cost of living). - The participants are responsible for covering the rest of their travel costs and residency/production expenditures. NB! The project team expects and encourages all the participants to actively help the fellow participants when visiting their country, including hosting them whenever possible. - A selection of 20 - 30 images (JPG format max size 300kb each) from 2-3 photography stories taken by you. The applicants will be pre-selected by project partners, final decision made by project tutors Vanessa Winship and George Georgiou. Selected participants will be informed by the beginning of June 2011. The project will engage 12 young photography artists in a documentary exploration of four countries representing geographical borders of Europe: Latvia, Turkey, Iceland, Portugal. The result will be summarised in a joint visual narrative – documentation of “European borderlines”. Twelve participants (3 from each country) will be selected to undertake personal projects – documentary and personal studies of the ‘borderlines’ in the duration of 9 months, followed by a joint editing workshop. The project work will include a residency at one of the other partner countries. The work will be guided and supervised by experienced documentary photographers Vanessa Winship and George Georgiou (UK). The final output will represent an exploration of differences and similarities, contrasts and likeness, frontiers and borderlines, both geographical and human – a visual narrative of the countries and people standing ‘on the edge’ of Europe. - to create a high-quality visual output bringing attention to the countries on the “EU periphery”. - project presentation at European photography festival/s. FUNDING: The project is funded by cooperation grants from European Cultural Foundation (http://www.eurocult.org/) and Open Society Institute Arts and Culture Program (http://www.soros.org/initiatives/arts), and co-financed by the partners. í Listasal Mosfellsbæjar á tímabilinu október 2011 - september 2012. Óskað er eftir umsóknum um einka- og samsýningar. og er lánaður endurgjaldslaust til sýnenda. Umsóknir skulu vera vandaðar berast fyrir 6. júní 2011. Haraldur Ingi sýnir í Populus tremula. Laugardaginn 14. maí kl. 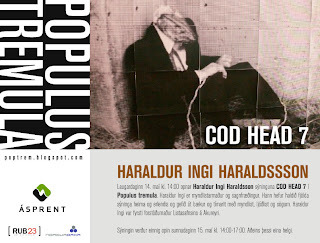 14:00 opnar Haraldur Ingi Haraldsson sýninguna COD HEAD 7 í Populus tremula. Haraldur Ingi er myndlistarmaður og sagnfræðingur. Hann hefur haldið fjölda sýninga heima og erlendis og gefið út bækur og tímarit með myndlist, ljóðlist og sögum. Haraldur Ingi var fyrsti forstöðumaður Listasafnsins á Akureyri. Sýningin verður einnig opin sunnudaginn 15. maí kl. 14:00-17:00. Aðeins þessi eina helgi. Laugardaginn 7. maí kl. 14 verða opnaðar margar nýjar sýningar í Safnasafninu Svalbarðsströnd. Í Vestursal er sýning á myndverkum Sölva Helgasonar (1820 – 1895). Sölvi Helgason, eða Sólon Íslandus eins og hann kallaði sig líka, er tvímælalaust einn af áhugaverðustu alþýðulistamönnum sem þjóðin hefur alið, heillandi utangarðsmaður í lífshlaupi sínu og listsköpun. Flakkari, fræðimaður og listamaður, en líka kenjóttur sérvitringur sem fór á svig við mannanna lög og reglur. Hann ferðaðist um landið með allt sitt hafurtask á bakinu, samanbrjótanlegt borð, bækur og málunargræjur, gisti á bæjum og skildi stundum eftir blómaflúraða mynd í þakkarskyni. Er sýningin á verkum Sölva unnin í samstarfi við Þjóðminjasafn Íslands sem geymir eitt stærsta safn mynda eftir Sölva, en einnig eru nokkur verk fengin frá Landsbókasafninu og Héraðsskjalasafni Skagfirðinga. Þessi sýning er þáttur í verkefninu Söfn í söfnum, þar sem verk úr safneign eins safns eru sýnd í öðru safni, til að varpa ljósi á menningarsöguleg tengsl safnanna. Í Austursal er sýning á verkum Katrínar Jósepsdóttur, eða Kötu saumakonu, þær eru fengnar að láni frá Listasafni Akureyrar í tengslum við verkefnið Söfn í söfnum, en 2. júlí mun svo opna sýning Safnasafnsins í Listasafni Akureyrar. Veggmynd máluð með blaðgrænu eftir Elsu Dórótheu Gísladóttur. Í Svalbarðsstrandarstofu er innsetning Elsu Dórótheu Gísladóttur, en hennar sýning teygir sig út í gróðurreitinn við hlið Safnasafnsins, sem fagnar 100 ára afmæli í ár. Verk Elsu Dórótheu fjallar um gróður jarðar og lífsorkuna og er að hluta unnin með íbúum sveitarfélagsins og skólabörnum. Á opnunardaginn mun Elsa Dóróthea planta eplatrjám. Í Norðursölum sýnir Hreinn Friðfinnsson innsetningu með bergkristöllum, steingervingum og sérstakri, syngjandi tíðniskál, Andrea Maack sýnir teikningar og Erla Þórarinsdóttir sýnir olíumálverk og granítskúlptúra. Í Langasal sýnir Ragnhildur Stefánsdóttir innsetningu með verkum úr gifsi, gúmmíi og silíkoni, form sem byggja á líkama mannsins og líffærum. Aðrir sýnendur eru Úlfar Sveinbjörnsson með útskorna fugla, Guðný Guðmundsdóttir með klippimyndir, Atli Viðar Engilbertsson með fólk úr pappa, Helgi Björnsson með tálgað fólk og húsdýr, Gloría López með útsaum, Björn Guðmundsson með útskorið og málað fólk, Hálfdán Ármann Björnsson með birkifólk og nemendur úr Hrafnagilsskóla sýna blómaskúlptúra undir áhrifum frá Sölva Helgasyni. Í endurgerðri verslun Ásgeirs G. Gunnlaugssonar verða sýndar hannyrðir eftir Jóhönnu Níelsdóttur og Jóhönnu Bjarnadóttur, en margt áhugaverðra muna leynist í hirslum verslunarinnar sem forvitnilegt er að skoða. Að venju er svo sýning á skúlptúrum Ragnars Bjarnasonar, úrvali brúða úr Brúðusafninu og fjöldi annarra gripa úr safneign, í nýstárlegum myndheimum þar sem blandað er saman ólíkum hlutum úr fjölbreytilegum efnum svo úr verður ein heild. Safnasafnið er opið daglega yfir sumarmánuðina frá 14 – 17, leiðsögn ef óskað er. ‎"Góðgæti" er sýning á verkum nemenda í Oddeyrarskóla á Akureyri sem verður opnuð laugardaginn kl. 14:00 í Sal Myndlistarfélagsins einnig verður þar listasmiðja fyrir börn. í BOXI sýnir Aðalheiður S. Eysteinsdóttir lágmyndir. Í glerskáp eru leikföng frá Leikfangasafninu Friðbjarnarhúsi.